Self-described as a community of rainbow engineers and their friends, NuclearPride is an association for lesbian, gay, bisexual, transgender, or queer people within the nuclear science and engineering field. A national organization, NuclearPride coordinates resources and provides community support to their peers. 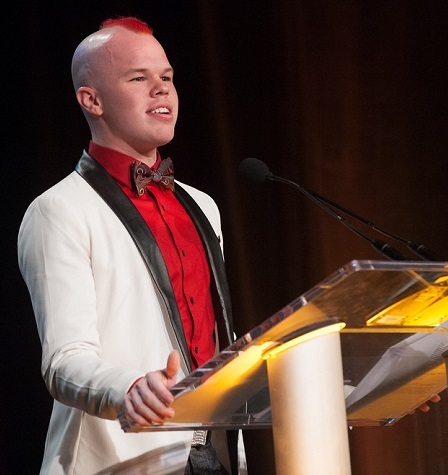 Sam Brinton is the co-founder of NuclearPride and an MIT engineer. NuclearPride’s mission is to help students and employees to ensure supportive environments and to advocate on behalf of its members to ensure that there is open dialogue between members of the nuclear community and ensure that all members of humanity are represented. The first person to testify before the United Nations Committee Against Torture on conversion therapy, Brinton is also continuing the push to end conversion therapy in his other role as Head of Advocacy for the Trevor Project, a leading national organization focused on crises and suicide prevention efforts for LGBT, queer and questioning youth. Conversion Therapy allows mental health professionals to engage in practices such as behavioral and cognitive practices to alter a minor’s sexual orientation or gender identity. “It is still legal in 40 states and all but two provinces in Canada and thousands of kids are put through it every year,” stresses Brinton. Apart from his advocacy work, Brinton uses his background as a nuclear engineer to look at improving acceptance of nuclear waste and available technologies that help to safely store such waste. “Acceptance of nuclear waste requires understanding of nuclear waste. I think there are a lot of people who don’t even realize what is going on with nuclear waste so one of the things that I have been talking about is the need to have a national public dialogue on the issue,” stated Brinton. Brinton would like to see more millennials stepping up their awareness of nuclear waste management and is working on a nuclear innovation bill to further raise public awareness. He has also created a campaign, Stand With Science, bringing together thousands of people to push for federal funding for science and engineering research.